Trends Ukraine turmoil Tags Irina Galushko, Military, Ukraine, Violence Kiev’s forces are using heavy weaponry and tanks in the eastern city of Mariupol to storm the local Interior Ministry building, where police have barricaded inside. 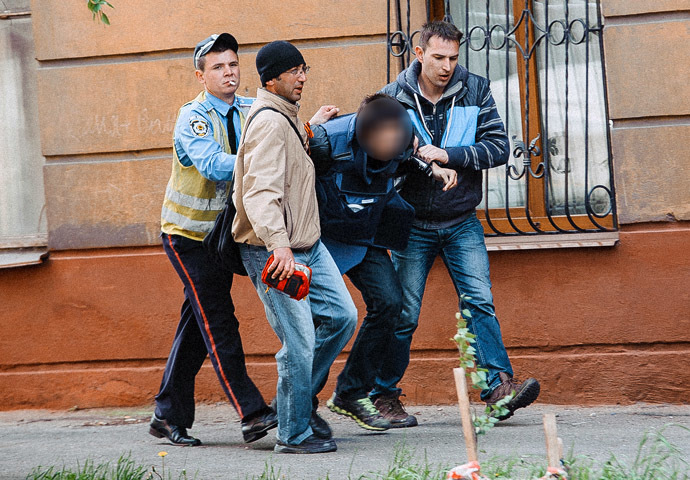 After residents began flocking to the scene, Kiev fighters opened fire on civilians. There are conflicting reports about the killed and injured. The Ukrainian Interior Ministry said that about 20 anti-Kiev activists were killed and four more were taken captive, according to a statement posted on Interior Minister Arsen Avakov’s Facebook page. However, according to Donetsk authorities, three people have been killed and 25 injured, RIA Novosti cited the Donetsk region council's press service as saying. Many people came to mark Victory Day, but as the reports of shooting started coming in, they moved on to show support for a few dozen policemen who had barricaded inside the building, refusing to take orders from Kiev. Federalization supporters screamed “Fascists!” as the Kiev forces approached. One of the armored vehicles then opened fire at a group of unarmed civilians, according to a self-defense forces’ representative. According to the 0629.ua news portal, “a tank was seized at the crossroads of Lenina and Torgovaya streets by the representatives of the Donetsk People’s Republic.” Mariupol’s residents have put up barricades in the streets, burned tires and turned over cars. “At 12.50, 14 tanks were spotted coming from the agricultural base towards Mariupol. According to medics, there are two dead and 8 wounded,” 0629.ua portal stated. According to the city’s health officials, there is a gun battle underway in the center and at least 4 people have been hospitalized with gunshot wounds, local 0629.ua news website reports. "About 1,500 people left the parade and went to the local interior ministry HQ. People in camouflage confronted them, shooting into the air using lethal weapons," a witness told Interfax. The witness also stated that another group of city residents set a car tire on fire next to the city council building. Earlier, self-defense forces in Mariupol reported that armed people had tried to seize the local city department of the Interior Ministry. The information on the number of casualties is now being checked, the self-defense forces representative said. Self-defense forces say the government forces used heavy weaponry while storming the local branch of the Interior Ministry. “Armored vehicles approached the building and opened fire with heavy weapons. local resident Grigory told RT. City streets are now on lockdown for transport and pedestrians, as armored vehicles are approaching from the airport outside the city. "Yesterday we were told that some provocations were being prepared, but people didn't believe it, so a Victory Day parade was scheduled for 9am today," a local resident, who identified herself as Victoria, told RT.